Located in the Cuyahoga Valley National Park, the Village of Boston Mills reflects the early 19th-century canal era and the early 20th-century industrial era. With the opening of the Ohio and Erie Canal from Cleveland to Akron in 1827, the settlement along the Cuyahoga River began to grow. By 1842, Boston Mills had a population of approximately 300. A water powered mill, a large warehouse, two stores and a hotel were some of the businesses in the village. Canal boat building was also an important industry with several dry docks in this inland port. Although the canal is not watered through the village now, one of the system’s locks is still extant and several Greek Revival frame buildings date from the early 19th century. The Upwright and Wing house type reflects the extended New England settlement culture. This style is exemplified by the main gable-front two-story section containing a parlor and bedchambers, while the kitchen is located in a perpendicular one-story eave oriented section. The 1836 Boston Company Store, with its Federal and Greek Revival influences, now serves as a Cuyahoga Valley National Park visitor center and canal boat building museum. Although the village stagnated with the end of the canal packet (passenger boat) era, the arrival of the Valley Railway in 1880 and the Cleveland—Akron Bag Company in 1900 began a new period of growth. 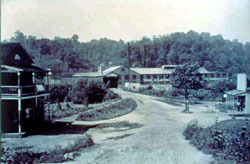 Connecting the industries of Cleveland with the coal fields in the south, the Valley Railway provided raw resources and access to markets for industrial operations. The Cleveland—Akron Bag Company brought with it many Polish immigrant workers and new houses—built and sold by the company. Several patterned concrete block houses and a school remain from this era, along with a company store building. 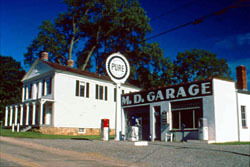 A somewhat later 20th-century building, the M. D. Garage has been restored, including period gas pumps and signage, and now houses art exhibits. The compact nature of the village creates streetscapes that juxtapose the buildings from each era. The Boston Mills Historic District is roughly bounded by Riverview, Boston Mills and Stanford rds. and Main St. within Cuyahoga Valley National Park. Boston Store, now a visitor center and museum, is open June-August from 10:00am to 4:00pm daily; November weekends from 10:00am to 4:00pm; closed September-October, Thanksgiving, and December-February. Call 216-524-1497 for further information.